Enhance Patios, Pool Decks, Garage Floors, Walkways, and Driveways in Fullerton, Anaheim, Yorba Linda, Orange, Anaheim Hills, and Brea. Decorative concrete stains and concrete sealers are a great solution for property owners in Orange County who are looking for a fast, easy, and economical way to elevate and refresh the look of a driveway, patio, or garage floor. Decorative stains adhere well to nearly any porous surface, which includes concrete, brick, plaster, and most natural stones. They can be used on interior and exterior areas, and because stains penetrate deeply into porous surfaces, they will not chip, peel, or fade. 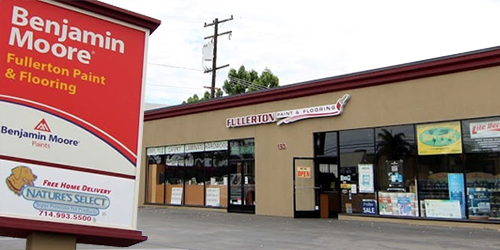 Stop by our showroom in Anaheim to learn more about our decorative concrete stains. Because everyone on our staff has between 20 and 35 years of experience, we're able to give you the guidance you need to get your job done right. While applying concrete stains and sealers is relatively straightforward, surface preparation can be tricky. Not only will we thoroughly explain how to prepare your surface and apply the stain to achieve the best results, but we'll also advise you on any other questions you may have, from choosing the right stain for your project to determining how to clean and etch your concrete (whether chemically, with degreasers and strippers, or mechanically, through scraping, etching, and grinding). We offer numerous colors to choose from, but can also help you blend concrete stains to achieve a custom color.